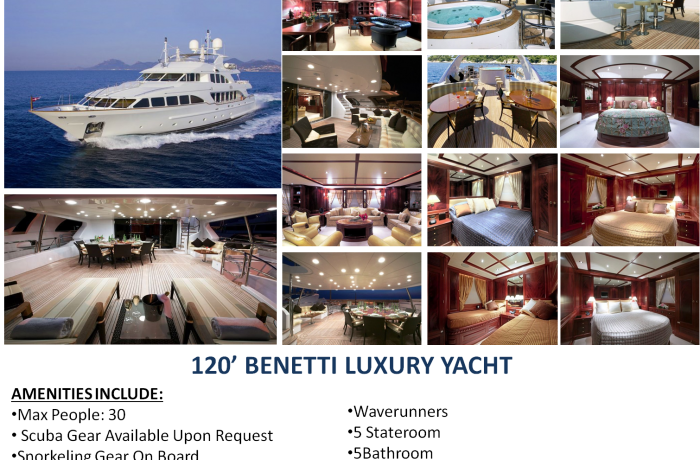 The Benetti Mega Luxury Yacht is an outstanding charter yacht that has been designed to provide ample living space, accommodating up to 10 guests for sleep overs or 45 guests for day charters. This luxurious craft was built to last with a timeless design, and offers the very best in quality, style and advanced technology. The fine crafted interior features complimentary designs with versatile space. The charter yacht features a open salon, decorated in neutral colors, has seating to accommodate larger groups, complete with a bar area and plasma TV’s. The vessels well appointed living areas integrate state of the art entertainment and communications systems. An on board chef comes with every charter. On the exterior of this Mega Beauty there is plenty of space on her top deck for soaking up the rays or taking a dip in the Jacuzzi while enjoying a cocktail. The bottom deck is an entertainers delight featuring deluxe seating areas and an oversized deck. The swimming platform provides easy access to the water toys including snorkeling equipment, small motor boat and other sporting equipment.